With the sun out, the trails mostly clear of ice and slippery mud (the ground is frozen), the thermometer needle sitting on 15 degrees, and Fairy Dust shimmering as it floated down out of the bright clear sky, Carol and I got our butts in the saddle, seeing as snow is predicted for tonight and tomorrow (!). 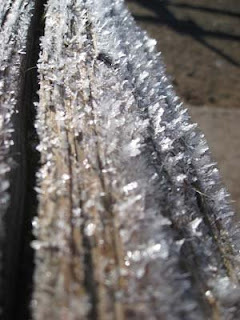 I saddled up Jose as the Fairy Dust continued to fall around us, settling on all exposed surfaces, leaving behind forests of razor thin crystal trees standing up in a brilliant salute to Nature's clever artwork. I discovered a breeze as soon as Jose and I headed toward Carol's house which would have been pleasant if it had been, say, 40 degrees, but at 15 degrees, it tended to penetrate right through the four layers I had on. We chose to go along Steph's trail on the ridge with our backs to the wind, then return home in the sheltered Training Wash. 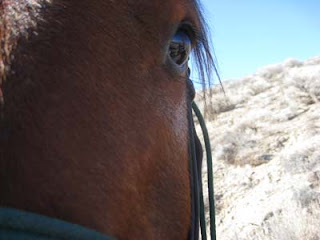 The horses' breaths were steaming, all our noses were cold and running, and Jose collected a bit of ice on his cheek under his eye, of all places. 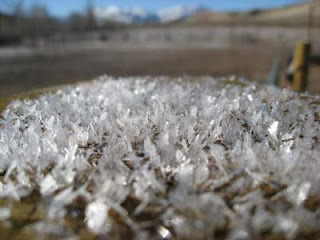 Even the cow pies had ice crystals on them. It was a beautiful day, so sharp and clear - the Boise mountains 50 miles to the northwest standing out pristinely and close (sometimes there's a layer of smog from Boise, and if you can see them, they look a hundred miles away), the Owyhees 6 miles to the southwest flawless and inviting. I've got warm enough riding clothes and gloves; now I just need some warmer shoes. 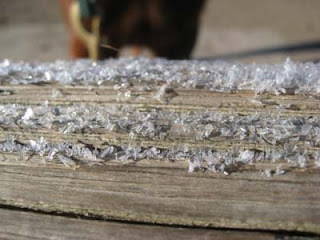 Not whining, but my toes felt like they were made of the Fairy Dust ice crystals that were still on the hitching post when we returned. Ahhhh the stuff that you can stick your tongue to! :) Very cool ride Merri. Glad you had such a nice ride with the most beautiful clear skies! 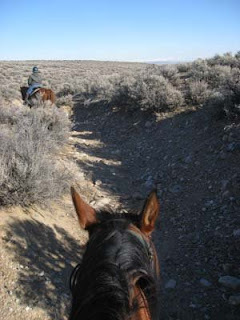 A friend and I were out in the Owyhees near Wilson Creek. 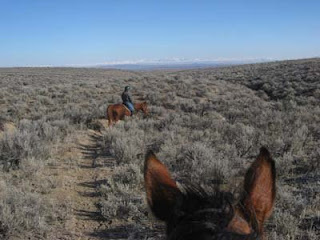 Yes indeed, it was clear, breezy, and chilly -- Fourth of July in Montana weather! We planned the day about right and we were both quite chilled by the time we returned to the truck. It was a great day to be out.